Despite having been around for more than 20 years, the compact disc still has its detractors who claim CDs sound "hard" or "unnatural." Others dismiss the format more generally saying it just sounds too "digital" to them. Despite some of CD's indisputable benefits, such as convenience and increased dynamic capabilities, there are people who still cant bring themselves to cozy up to the diminutive aluminum disc. Some of them eschew digital completely, preferring to cling to the LP, despite the increasing unavailability of new records. But there are also those who don't care for CDs sound, who have adapted to the digital era by employing carefully chosen components that soften or cover up the offending digits in an effort to make CDs sound more like analog. This often involves introducing tubes somewhere in the system or finding cables that "smooth things out." That's fine, says Taddeo Loudspeaker Co., a small, upstate New York company, but those band-aids treat the symptoms without addressing the major cause of the problem: phase distortion. Fortunately, the firm just happens to offer a surprisingly affordable solution to what they see as the problem. 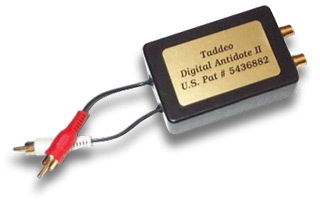 The Taddeo Passive Digital Antidote Two (PDA II) is a small device that costs only $99.95 USD. People familiar with Taddeos previous phase-correction devices may raise their eyebrows at this price, since their more upscale product costs almost $1000. The PDA II itself measures only 3.5"L x 2.25"W x 1"D, weighs only a few ounces, and is contained in a plain, black plastic box. The PDA II sports two gold-plated female RCA inputs on one side and two garden-variety male RCA connectors on the other, which are attached to the unit by two generic-looking coated wires measuring 2" in length. This is very convenient since it allows the PDA II to be connected between two components without the need for an additional set of interconnect cables. What sharper-eyed readers may have deduced by now, and what uniquely separates the PDA II from other digital correction devices, is that it operates exclusively in the analog domain. In fact, the unit can be installed anywhere in the analog chain after the CD player or digital-to-analog converter (DAC) and before the amplifier or receiver. It slips right into your system with no muss or fuss -- its so small that it doesnt require any shelf space, and since its a true passive device you dont even need to tie up an electrical outlet. I was able to simply insert the PDA II between my Electronic Visionary Systems Millennium DAC 1 and my Rotel preamplifier, which took all of ten seconds. It just doesnt get any easier than this. For comparison purposes, Taddeo also sent along its upscale $995 Active Digital Antidote Two (ADA II), which is the latest incarnation of the most expensive implementation of their technology. The ADA II does require a shelf in your audio rack, another pair of interconnects, and an electrical outlet to operate in your system. Obviously, the passive models ease of use and relatively low price put Taddeos technology within the reach of more audiophiles. Taddeo says that phase distortion is a byproduct of the digital sampling rate. And despite DVD-A's and SACD's higher sampling rates, Taddeo says phase distortion is still present in those newer high-resolution digital formats, although to a lesser degree than with CD. The Taddeo units incorporate a proprietary, patented circuit that "corrects" what the company sees as phase problems in the analog output signal. Correct the phase distortion, according to Taddeo, and the sound becomes more natural and less "digital." This phase correction, however, is not without tradeoffs. By definition, correcting phase as Taddeo does will reduce output at a given frequency. Since lower frequencies are sampled more than higher-frequency signals, phase shift (distortion) increases as frequency rises, so more correction is needed in the treble than in the midrange or bass. According to Taddeo, after phase correction, a 20kHz signal is 3dB down in output while a 10kHz signal is down only 1dB. So by correcting phase distortion, a price is paid in the form of a slight roll-off that will manifest itself mostly at 15kHz and above. Since much of the blame for digital audios perceived shortcomings occur in the high frequencies, it is easy to see how this side-effect could produce pleasing results in bright- or hard-sounding systems. I started my audition with Steely Dans Gaucho [MCAD-37220], a bright, hard-sounding early 80s CD transfer -- it's all the things CD detractors loathe. Once the PDA II was installed, the cymbals, although still bright, actually took on a more realistic cymbal-like sound rather than the distorted, sizzling hash that preceded it. In addition, Donald Fagans vocals were smoother sounding with much less of the biting edge that was present on the unprocessed disc. Moving up the recording quality scale to the soundtrack from Gladiator [Polygram 467094], the PDA II again had the effect of softening the overall presentation of this all-digital recording, which I thought made it more pleasurable to listen to. The brass on this disc sounds just a little too hard-edged and zippy. Inserting the PDA II made the whole brass section sound more natural by softening some of the overly hard attacks of individual notes and phrases. It also allowed more of the inherent tonal properties of the instruments through. One tradeoff, however, was a slight reduction in the sense of the recording space as reverberations from the recording venue were slightly muted. Not surprising, actually, since the device attenuates the high frequencies. To further explore the PDA II's bass and soundstaging capabilities, I brought out Tony Falangas Soul of the Bass [Plane 88846], which features the double bass in a nice mix of classical and jazz arrangements. In general, the PDA II did not seem to have much of an effect on low-bass frequencies, but on "Jota" I did notice more of the warm, woody, tonal characteristics of Falangas double bass. I also noticed that the sound of the bow scraping on the strings was better integrated with the instrument, rather than presenting itself as a separate sound. The piano also sounded fuller and there was less focus on individual notes being struck, and more of the resonance associated with the soundboard and body of the instrument. "Iberique peninsulaire" is a soundstaging marvel, and the PDA II did nothing to either enhance or detract from the depth captured in the recording, although there was a slight reduction in detail and sense of space toward the rear of the stage, similar to that I heard in Gladiator. The differences Im describing here are subtle. To hear all of what the PDA II is doing, you need to listen closely at first to see both what is being screened out and what is allowed through in the musical presentation. A good example of this is "Cyril Davies" from Ginger Bakers Coward of the County [Atlantic 83168-2]. I did not immediately hear significant differences when the PDA II was inserted, but upon further listening, I was able to tell that the sax sounded more coherent. All the wonderful sounds produced by James Carter during his solo blended into the whole of the instrument rather than coming across like an instrument with several distinct parts. This may sound like nitpicking, but, to me, one sounds right and the other does not, and that is indeed a big difference. What struck me about this -- and also the Falanga disc -- was that the benefits of the PDA II were not limited to the high frequencies as I had expected, but also filtered down to the mid- and even the upper-bass ranges with subtle but meaningful improvements. After spending considerable time with the PDA II, I substituted the ten-times-as-expensive ADA II to see what you get for the additional $900. Plugging the upscale ADA II into my system, I noticed two things: The level of high-frequency detail was greater with the ADA II and overall dynamics were better preserved. In general, it was more difficult for me to detect when the more-expensive unit was in my system (i.e., it was more transparent), but I would also say that it seemed to be doing less in terms of "correcting" the signal. The effect on cymbal hash and digital sheen was still there but in a very subtle way, so if you are quite happy with your system but are looking for that last bit of refinement, the ADA II may be better suited to your situation -- providing you can afford it. But if your CD playback is clearly not making you happy, you may benefit from the more aggressive correction that the less-expensive PDA II provides, understanding that you will likely sacrifice some air and detail in the upper octaves. What makes the Taddeo PDA II so appealing is its relatively low price, coupled with the fact that it brought tangible benefits to both good and poor CD recordings. Inserting the PDA II into a system also has the virtue of being infinitely easier than auditioning a bundle of cables, and/or other box components, to tame CDs or less-refined CD or DVD players. At $99.95, the PDA II is one of the cheapest tweaks I can think of that really does something significant to a systems sound. If youve been searching for that certain something to help you warm up to your CD player, the Taddeo Passive Digital Antidote Two just might be what you're looking for.